Rihanna has given fans a preview of her new collaboration with Sir Paul McCartney and Kanye West. The trio have teamed up for new single FourFiveSeconds, and the Diamonds singer has shared some footage, ahead of the full music video premiering on Vevo later today (February 3). "#FourFiveSecondsVideo sneak peek...first Official video from my new album premieres tomorrow Feb 3 at 9am EST. (6am PST.) on @VEVO!! #KanyeWest @PaulMcCartney @inezvinoodh," she wrote. 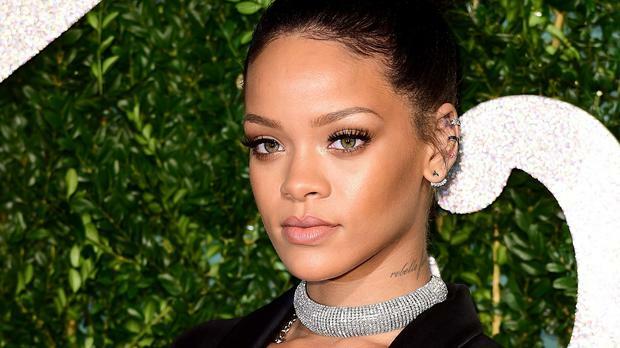 Rihanna then posted two clips on Instagram and Twitter, which featured her singing the stripped-back lyrics, while wearing Kanye's denim jacket and a bra. The 26-year-old singer posted a behind-the-scenes clip, in which Kanye and her have matching outfits. "We are here shooting the music video for FourFive with Kanye and Sir Paul McCartney," she said. "This is the first song my fans are going to hear from the new album and the first visual they see." She explained the wardrobe choices, saying: "Kanye came up with the idea of doing just some real street denim all-American type look. This is actually his jacket that is some Sean John throwback vintage jacket that is f***ing major. That's the look. That's the fashion tip. "Denim never goes out of style. It's classic. It's iconic just like the f***ing Beatles!" she added. FourFiveSeconds is the lead single off Rihanna's eighth studio album, Home - a concept project inspired by the forthcoming animated film Home. The trio will perform it at this weekend's Grammy Awards.